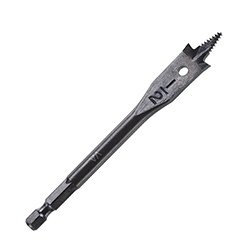 Black Max™ spade bits feature a black quench coating that increases wear resistance. They cut 3X faster than standard spade bits thanks to the innovative screw point tip. The tip is threaded like a wood screw and literally pulls the bit through the wood for fast cutting action. The pulling action of the tip means less pressure is required behind the bit making overhead applications easy on the arms.